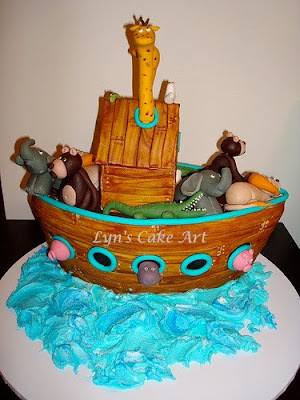 I took a 2-day course that teaches how to make this AMAZING 3D Noah's Ark cake. It was the hardest cake I've ever made. I wanted to keep it forever! Instead, I took a deep breath.... then another deep breath...... took up the knife and cut it up to serve to my friends. this cake was sooooooo amazing when i tried it!!!! im definitely going to keep you in mind for my kids birthdays or any party that i need cupcakes for!!! I had the honour of trying this cake...it was not only delicous tasting....it also looked amazing! It was almost too pretty to eat but we just couldn't resist ourselves! it was obvious that a lot of effort was put into it!